US President Donald Trump tweeted out his thanks to the Mexican government a few hours ago after they decided to sent hundreds of police to its southern border as a caravan of thousands of Central American migrants continues to approach from Guatemala. Mexico's reaction has been to step up security on their southern border with Guatemala. Hundreds of federal police officers and immigration officers have been sent to the porous border region along the Suchiate River which divides the two neighboring Central American countries. 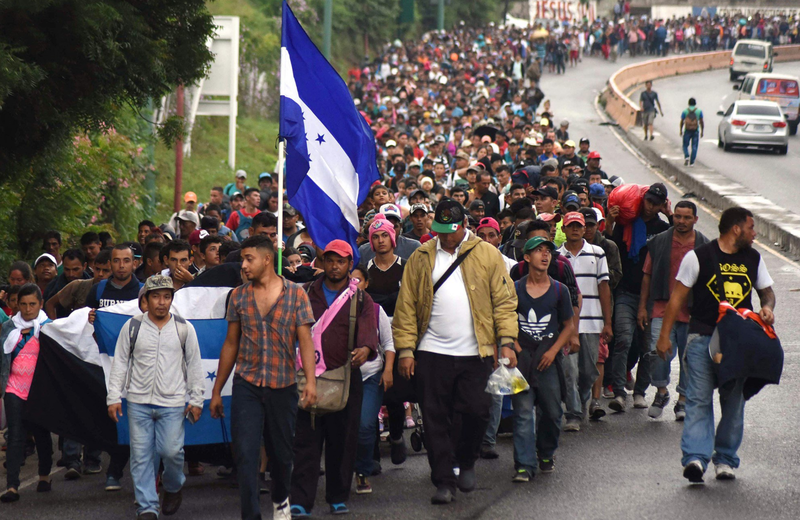 The thousands of migrants which are a concern started their trek earlier this week in Honduras and have swollen by now to almost 4,000 strong. Mr Trump threatened earlier to cut aid to Central American nations if no action was undertaken to stop the group heading for the US’s southern border. The event takes place just weeks before the mid-term elections to be held on 6 November, which could see Democrats take back control of the House if opinion polls ring true. The group of Salvadoreans, Hondurans and Guatemalans clam to be fleeing violence and poverty and human rights groups have condemned the actions of the US and Mexico so far. Ms Erika Guevara-Rosas of Amnesty International stated: "Mexican authorities should not take a Trump approach treating people like a security threat." "These families deserve dignity and respect to ensure that no one is illegally returned to situations where they could risk serious harm due to violence." Mexican has already stated that anyone presenting itself at the border would have to apply for refugee status or turn back. Related coverage: <a href="http://thegoldwater.com/news/39712-Trump-Slams-Caravan-And-Threatens-To-Close-Southern-Border-Video"> Trump Slams Caravan And Threatens To “Close Southern Border” (Video)</a>. The White House administration meanwhile confirmed that US Secretary of State Mike Pompeo would be visiting Mexico this Friday and that he will discuss plans to stop the caravan. Mexican president-elect Mr Andrés Manuel López Obrador who takes office in December only, claimed he would offer work visas to Central Americans fleeing violence. "It is a plan that we have, that anyone who wants to work in Mexico will have a work visa," he stated. WHAT WORK DOES MEXICO HAVE TO OFFER WHEN THEY DONT HAVE ENOUGH JOBS FOR THEIR OWN PEOPLE? EVERYONE KNOWS THIS IS THE HAND OF SOROS DOING HIS MASTERS BIDDING, AT ELECTION TIME, BC THEY KNOW DEMS COULDNT WIN DOG CATCHER NOW. AND EVERYONE ALSO KNOWS THATS EXACTLY THE INTENTION OF SENDING THEM TO THE U.S. AS A SECURITY THREAT!!! AND TO SUPPORT THEIR PROJECT MOCKINGBIRD AGENDA!!! WAVE THEM IN FRONT OF THE CAMERAS. USE THEM LIKE THEY DID CHRISTINE BLASEY FORD!!!! MANIPULATING LAIRS!! !